As part of the Global Urban Humanities Initiative Colloquium called Reading Cities, Sensing Cities, we have asked students and visitors to write responses to each of the weekly guest lectures. On September 11, 2014, Lauren Kroiz spoke about Berkeley—The City and Its People, a mural by Romare Bearden that once hung in Berkeley City Hall, was exhibited at the Museum of Modern Art, and is now indefinitely in storage. She asked viewers to consider the intentions of the city leaders of 1973 in inviting a well-known African-American artist from the East Coast to portray their city. Kroiz is Assistant Professor of Art History at UC Berkeley. Her presentation is available here. Video of her presentation is available here. As an architecture student who graduated from a fine arts school, the lecture by Professor Lauren Kroiz inspired me a lot. I’ve seen the Berkeley city logo many times—mostly it’s just in black and white. During the lecture, I learned that this logo has a deep relationship with this multi-racial city and that it symbolizes the city’s diversity. These four different-colored profiles of heads can be found on the bottom center of a mural which is called “Berkeley--The City and its People.” This delicate masterpiece was painted by artist Romare Bearden. The painting was composed on seven fiberboard panels joined together. It’s Bearden’s largest known collage and the 12-foot by 16-foot mural for the City Council chambers impressively showed the co-existence and harmony of the city. What’s really interesting is that Bearden worked as a social worker in New York City for 30 years. As a person who was not rooted in Berkeley, Bearden traveled throughout the city for only a few days to collect materials for the painting. Afterwards, he went back to New York to finish the painting. It combines a great number of diverse, fragmentary images and abstract shapes, vertical lines and grids which enhance the visual expression. The elements of photographs of faces of different colors and races, architectural details, figures of importance to Berkeley’s history, and abstract motifs depict the diversity of the people and their lives. Yuqing Nie is a candidate for the MArch degree at UC Berkeley. In 1972 the renowned Harlem-based African-American painter and activist Romare Bearden came to Berkeley for ten days to visit the city and get an insight into the life of the community. The City Council commissioned him to paint a work in which Berkeley’s multicultural richness would emerge clearly, and he wanted to capture Berkeley’s spirit, engaging himself directly in the many different realities of the city. These realities ranged from UC Berkeley’s environment to the festivals along Telegraph Avenue and local Buddhist services. 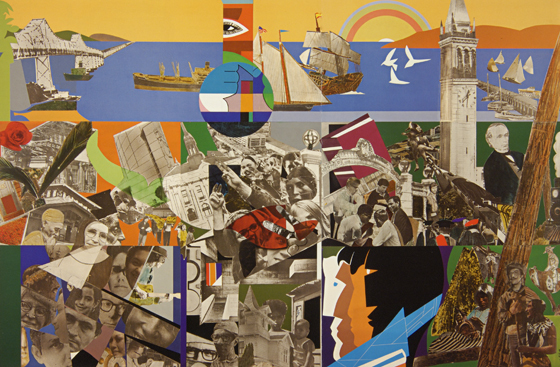 As a result, Bearden realized the eight-panel mural entitled “Berkeley – The City and Its People” (1973), a vibrant, dynamic and deeply personal narrative of what Berkeley looked like in the Seventies. It has since then become the symbol of the city and the four profiles on the bottom center have come to serve as the city logo because they express Berkeley’s multi-ethnic complexity. The mural, one of the few works in which Bearden dealt with an unfamiliar environment, shows his understanding of Berkeley as he experienced it. Bearden read the city, sensed it and then portrayed it back in his studio in New York, drawing on both his personal recollections and the visual materials he brought with him. The mural can be seen as a singular guidebook to Berkeley because one can easily identify the city’s major attractions (Berkeley Marina, Sather Gate, the Campanile, etc. ), but at the same time it conveys the image of an idealized community and the hope for a better future. The unique relationship between particularity and abstraction, private lives, actual details, symbolic meanings, dream and utopia, as Professor Lauren Kroiz pointed out, is what makes this work so fascinating. Starting from the mid-Sixties, Bearden considered the potentiality of collage and photomontage. Here, drawings and photos of Berkeley’s inhabitants are juxtaposed with simplified and colorful forms in a syncopated jazz rhythm. Time is compressed in the flat, smooth dimension of the collage: past, present and future are united on one screen to create a new and potentially unexpected collective story, a narrative more aware of the value of each and everyone’s cultural roots and their significance for the community to come. Elisa Russian is a first year Ph.D. student in the Italian Studies department. In representing a place, we are as much limited by the constraints of the two-dimensional canvas as we are by our narrow experiences. Romare Bearden’s mural “Berkeley--The City and Its People” presents an example of the flattening of place into symbols, artifacts of emotion, memory, and still other intangible provisions of identity. Berkeley deconstructed itself during the Free Speech movement of the 1960s, and as the city entered the 1970s, residents found in the renovation of City Hall an opportunity to manifest the transformation via monument. 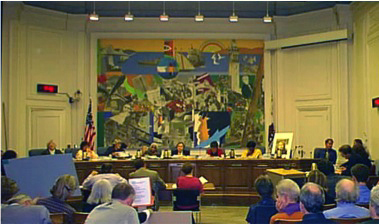 Thus, the démodé landscape photograph that occupied the chamber of City Hall was to be replaced with a mural by Romare Bearden. The selection of this black artist served to communicate Berkeley’s embrace of diversity, but why not select a person of color who was a local son or daughter? Much like the decision to establish a symbol of the new Berkeley, the selection of this artist was an explicit vision of the city. Based in New York for the majority of his life, Bearden was an established name in American art by the 1970s. In commissioning him, Berkeley councilmembers used the artist’s race, urban subject matter, and art-world renown as a proxy for describing the city’s progressive, cosmopolitan, and aesthete qualities. Bearden was famously known for capturing life of a specific segment of Black America. His collages are scenes of brownstone and cement where the lifeblood of community flows through arteries of a bustling physical environment. As mentioned during the class discussion, “Berkeley--The City and Its People” depicts a busy jumble that feels more like the artist’s home of New York City. The style of Bearden’s mural gives the impression that Berkeley is a bustling, vibrant place, but this summary necessarily discards the quiet and the somber, the routines that inform daily life. It was said that Bearden’s 10-day visit to the city came with a detailed agenda, and in designing the artist’s experience in this way, the patrons of the mural had to decide what to highlight. In effect, the mural was created by committee, but it is arguable whether the resulting pastiche shows the compromise of collaboration, the limited engagement of the artist, or the idealism that is part of bestowing identity to a place that means different things to different people. Faith Hutchinson is a candidate for the Master of Information Management and Systems at the UC Berkeley School of Information.